This small dichroic glass ring is perfect for "gazing" and meditation when you're stressed. It features a "ruffled" backplate (my favorite!). This ring features a bright yellow coin pearl in a heavy sterling silver bezel setting. This popular spinner ring is created from sterling silver, with three delicate bands. Variations include 14K bands, wide hammered brass bands...the options are endless. This delicate ring features a rose-cut aqua blue chalcedony (pronounced "kal-sidney"), set in a beaded bezel setting. 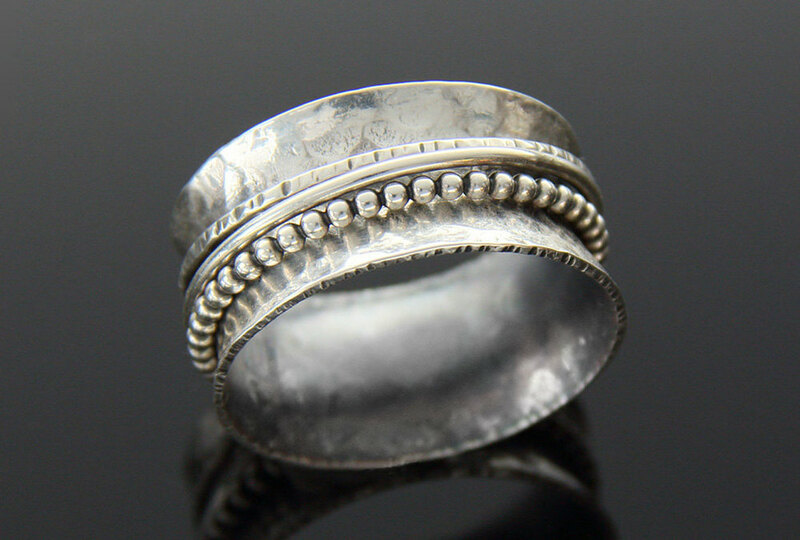 This variation of my popular spinner ring has a hammered "ruffle" texture on the main band. This layered glass ring features a sprinkling of delicate dichroic "stars" and swirls...gazing deep into this ring will put your heart and soul at ease! These variations include my "ruffled" spinner ring, and a thinner spinner ring with 14K spinner. This pretty little turquoise ring has a standing "frame" to protect the turquoise, which is set in a bezel setting. 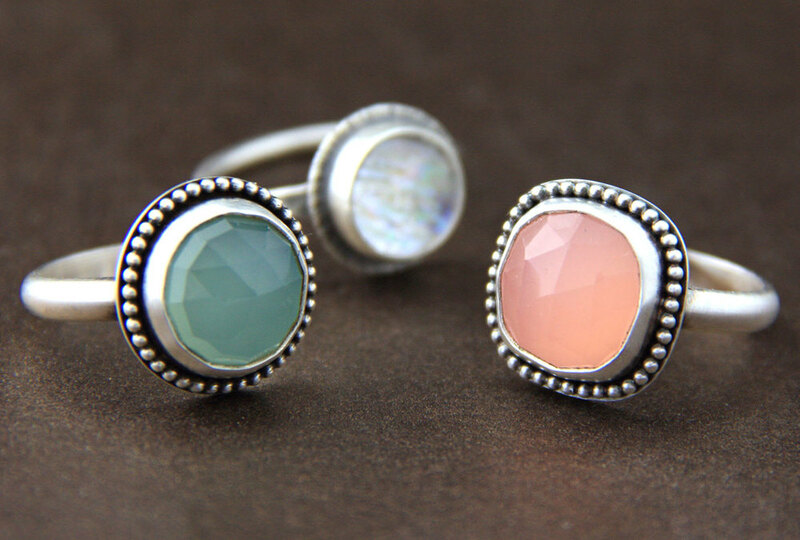 The Aqua Blue Beaded Chalcedony Ring, the Pink Beaded Chalcedony Ring, and the Dichro Meditation Ruffle Ring. Textured anticlastic band with delicate leaves. 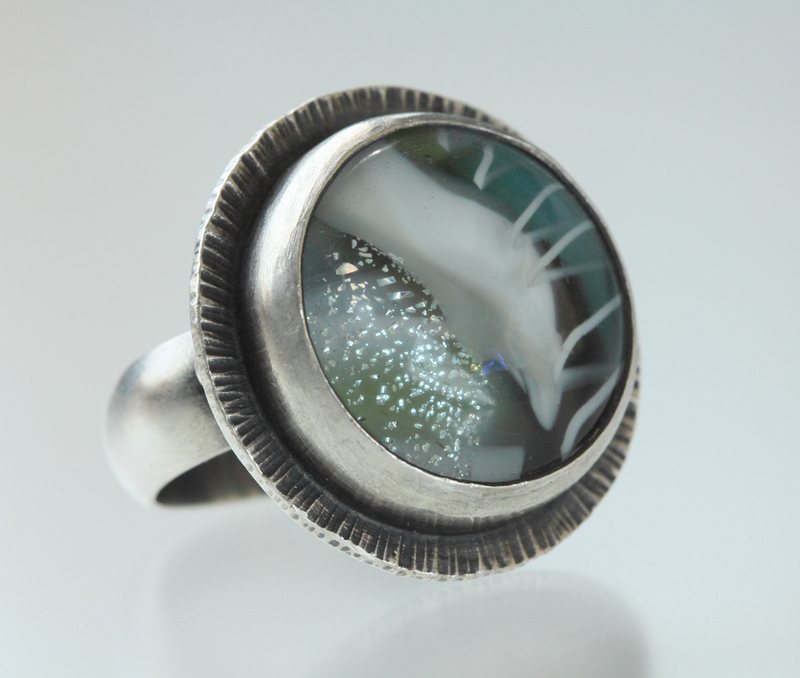 This bezel set fossilized sand dollar ring has a tube-set cubic zirconia and a delicate silver ball. The band is a low-dome wide band. 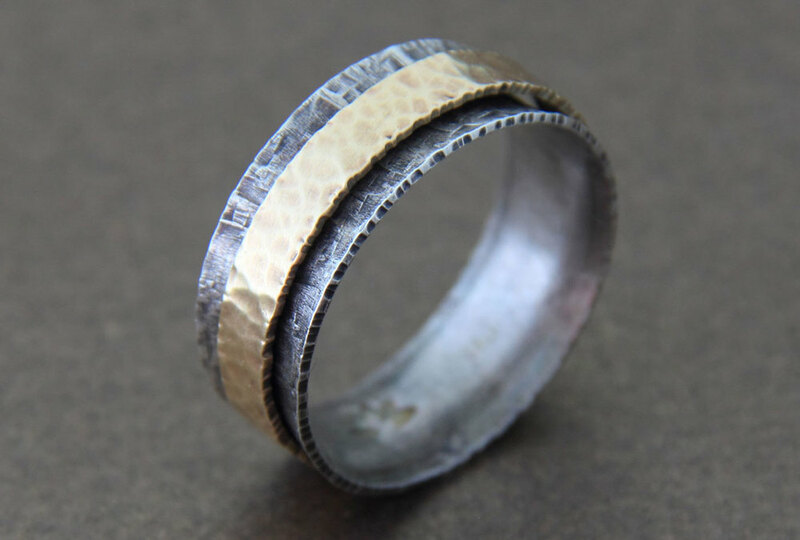 This spinner ring has a "rustic" hammered pattern on the main band, and a hammered red brass spinner band. This thinner version of my spinner ring features a solid 14K spinner band. Rings are new to my collection, so I'm experimenting with styles and stones. 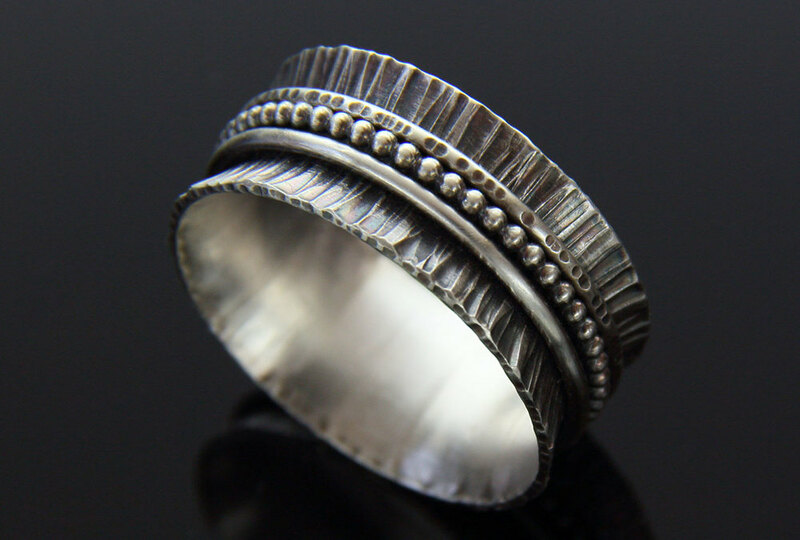 The first ring shown is my best-selling spinner ring. Three delicate bands in silver or gold jingle and spin, keeping me entertained for hours! Be sure to "pin" the ones that you like best!